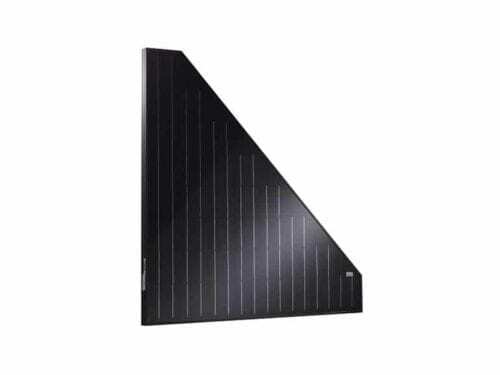 The Trienergia TRI100BC-BB 100W Mono All Black Triangle Solar Panel is the result of brilliant intuition in and because its simplicity reflects the excellence of Italian Design. 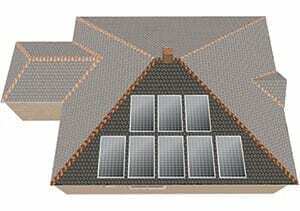 The rectangular PV modules of standard dimensions are difficult to integrate in harmonious lines in most roofs. 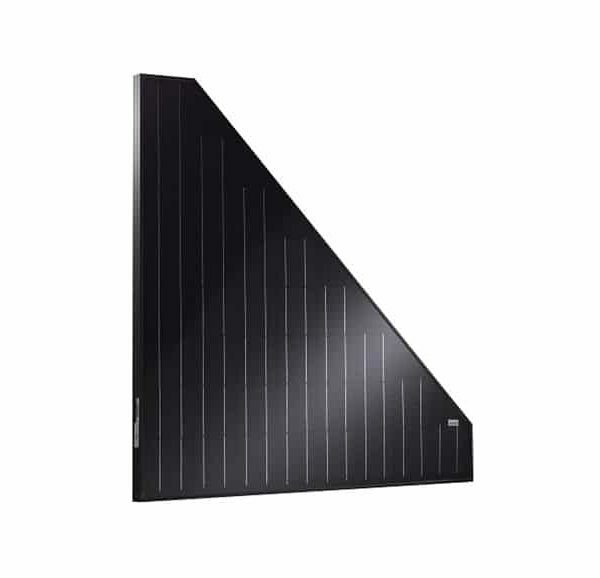 The triangle shape provides a wider range of solutions, boosting PV installations in terms of aesthetic result and installed capacity. The chance to freely combine rectangular and triangular modules results in a practical and ideal arrangement of PV panels. These Trienergia TRI100BC-BB 100W modules are able to cover larger areas (up to the entire triangular roof) and because if this resulting to higher installed capacity. The combination rectangle + triangle is the most efficient solution. 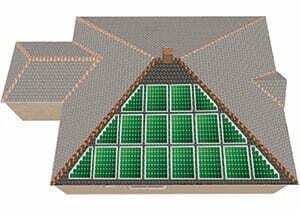 In mixed PV systems rectangular modules are perfectly matched with half-power triangular modules. In a few words: 2 x triangular connected in series = 1 x rectangular. So, this way you realize a mixed string without the need for nonstandard cabling devices. The majority of roof areas in the UK are hipped, which means they have irregular faces. This can make it difficult to fill all of the available space on the roof with solar PV modules but Trienergia has the solution. The modules are very versatile and can be arranged in various ways on the roof to maximise the use of space. Solaranna’s range of Schuco and Schletter clamps are compatible with Trienergia modules. In all mixed PV systems (rectangular and triangular) rectangular modules (with a power of for example 220 Wp) must always be matched with half-power triangular modules (110 Wp). So, this way it is possible to realize mixed strings without particular cabling devices. 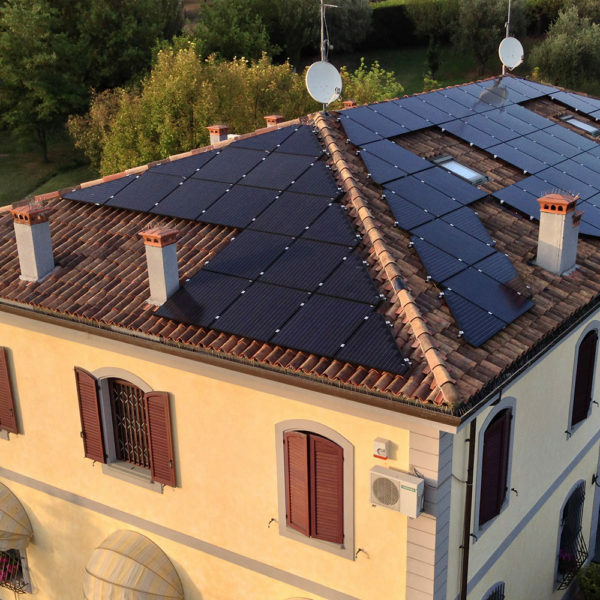 Trienergia is an Italian company which manufactures all their solar panels in Italy. Trienergia is the first photovoltaic modules producer to produce a solution for triangular roofs, with the added bonus of making it look seamless. By using triangular and square panels, their adaptable system means that you can utilize all roof space for your customers. The modules have been studied and designed from Trienergia after making a careful choice of raw materials and making arrangements with a few producers in the world to start series production. The best prices in solar panels for ZERO Home Bills on ZEROhomebills.com by Solaranna. Join our ZERO Home Bills Community. Trienergia is an Italian company which manufactures all their solar panels in Italy. Trienergia is the first photovoltaic modules producer to produce a solution for triangular roofs, with the added bonus of making it look seamless. By using triangular and square panels, their adaptable system means that you can utilize all roof space for your customers. Trienergia modules have been studied and designed from Trienergia after making a careful choice of raw materials and making arrangements with a few producers in the world to start series production. The best prices in solar panels for ZERO Home Bills on ZEROhomebills.com by Solaranna. Join our ZERO Home Bills Community.